This may be the easiest spicy chicken recipe ever! Each of the 5 ingredients in this recipe plays a key role to the overall flavor. The chicken comes out of the slow cooker tender and juicy with a nice deep color from the chilis. The heat in the chicken is slow and smoky. As you begin eating, you don't really notice the spice, but as you keep eating, it begins to creep up on you like a smoldering fire. While we ate the chicken as is with a side of potatoes, I can see this recipe used as the base for chicken tacos, enchiladas, quesadillas, etc. The meat is so flavorful and tender that the possibilities are endless. 1. In a large slow cooker, line the bottom with sliced onion and garlic. Place the chicken on top of the onions/garlic. Top with Chipotles in Adobo. Use the water to rinse the can and pour into the slow cooker. 2. Place the lid on the cooker. Set to LOW. 3. Allow to cook for 6-8 hours. Over the past year, my husband and I have been heavily focused on eating a more natural, less processed diet. We completely gave up drinking soft drinks, increased our consumption of fresh fruits and vegetables (which thrilled me!) and became much more intentional about our food choices. The result has been amazing. Once you begin filling your body with the goodness from nature, you find your skin to be clearer, your hair shinier, nails stronger, and even better digestive health. One of my major changes has been a consistent effort to consume lunches based in vegetables. I have always been a vegetable lover. As a kid, I was the one that would fill up on the salad bar and leave the meat behind. A key to eating a plant-based meal is to make sure the flavor is punched up in order to feel satisfied and not deprived. This recipe is one such meal. The filling is flavorful and hearty. You can make this recipe completely Vegan by substituting Vegan Cheese for the cheddar, if you like. I can also see morphing this into a party dish or appetizer by making Veggie Stuffed Skins. 1. Thoroughly wash and dry the potato. Pierce the skin of the potato with a fork. You will want to puncture the potato several times. This helps the interior cook. 3. Bake at 425 degrees for 1 hour or until soft throughout. 4. Ten minutes before the potato is to come out of the oven, begin to prepare your filling. Melt the vegetable spread in a small skillet over Medium heat. Add the carrot, onion, and mushroom to the pan. Sprinkle with salt and pepper. Saute for 5 minutes, stirring occasionally. Add the spinach and allow to wilt. Remove from the heat. 5. Once the potato is cooked throughout, remove from the oven. Carefully slice the potato down the middle and squeeze the ends to fluff the interior. Tear the cheddar cheese into small pieced and lay inside the potato. Place back in the oven for 3 minutes. 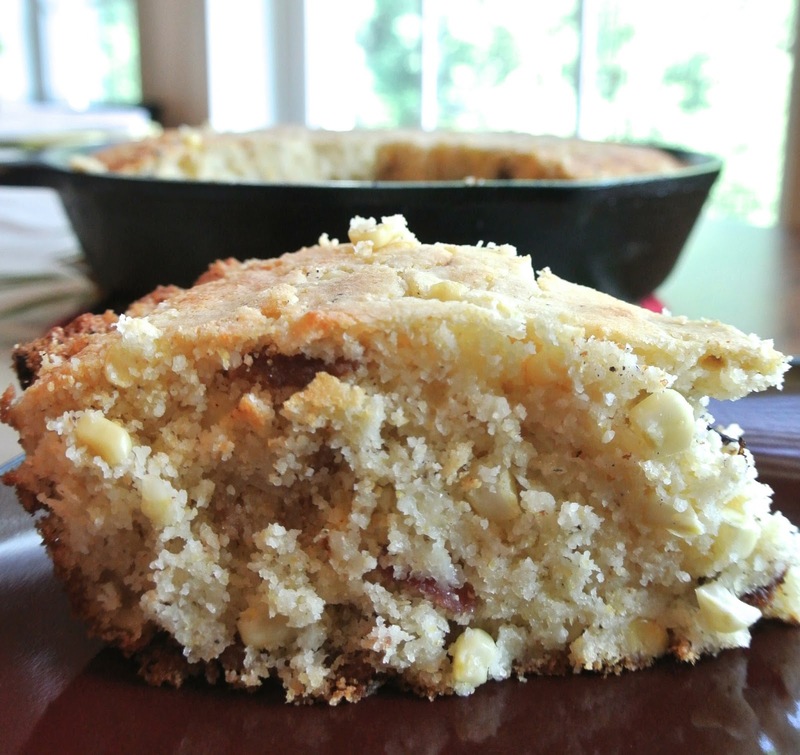 As you may know, cornbread is a staple in the South. I have very vivid memories of eating my Papa Blackburn's cornbread as a kid; he would make a cornbread laced with fresh corn kernels, chopped peppers, and cheese. It was not until I was older that I realized it was a Mexican Corn Bread recipe and not just something my Papa made......ahhhh......to be young and naive again. This recipe is a spin on this memory. Instead of peppers, I opt for crispy bacon. However, I will say that you must still have a hot cast iron skillet for baking. You cannot get the texture without this essential tool! The addition of the bacon really does make this an all-in-one meal, even though we still just enjoyed it as the bread with Sunday dinner. My husband already has plans for Fall tailgating, camping trips, and future meals. I think that I will turn this into individual cornbreads or corn muffins. Oh, the possibilities! 1. Heat a large (10-inch) cast iron skillet over medium heat. Cook the strips of bacon until crisp. Remove to paper towels to drain. 2. While the bacon is cooking, Use a very sharp knife to carefully remove the kernels from the corn cobs. Place the kernels in a large mixing bowl. 3. Add the corn meal mix and sugar to the corn. Stir to combine. 4. Whisk together the eggs and milk. Slowly stream into the corn meal mixture. 5. Add the shredded cheese. Stir until combined. Note: I like to use a blend of cheddar and pepper jack, however, you can choose your favorite cheeses. 6. Once the bacon is crisp and drained, chop into bite size pieces. Stir into the cornbread mixture. 7. Carefully stream 3 Tablespoons of the hot bacon grease into the cornbread batter. Stir. 8. Pour the batter into the hot skillet. Place in a 350 degree oven and bake for 45 minutes or until cooked throughout and browned on top. Note: Oven times may vary. Bake until a toothpick comes out clean and golden on top. Okay, I have got it.....the BEST chicken recipe EVER! I am serious! This meal was nothing short of amazing!!! Can you sense my excitement??? My original hope was to make something so spicy that my husband would get over his current obsession with heat, however, what emerged are a well-balanced, delicious recipe (spicy yet sweet) highlighted by tender, moist chicken and a beautiful pan sauce. So when I say this is the best chicken ever, I am not lying!! This recipe is also very budget friendly. For a family of 4, all you need it two boneless, skinless chicken breasts. That is definitely a budget-friendly meal!! 1. Heat a large skillet over medium heat. Allow the butter to melt. Add the onion and garlic; sauté for 3 minutes. Add the black pepper, cayenne, mustard powder, salt, and red pepper. Sauté for an additional 2 minutes, allowing the seasonings to toast and release their flavor. 2. Add the vinegar to the pan. I recommend standing back when you do this, otherwise, you will get a really good sinus clearing from the steaming vinegar. Stir. 3. Stir in the sugar, ketchup, mustard, and Worcestershire. Simmer for 10 minutes, stirring occasionally. While the sauce simmers, prepare the remaining ingredients. 4. Carefully butterfly the chicken breasts and separate them into 4 thinner pieces. By doing this, you create 4 fillets (total) from the 2 breasts that will cook more evenly during the baking process. Wrap each breast fillet with 2 strips of bacon. 5. Spray the bottom of a 9x13 baking dish with non-stick cooking spray. Line the dish with the onion slices. Place the breasts on top of the onions. 6. Pour the hot pan sauce over the chicken. Tightly cover the baking dish with foil. 7. Place in the preheated oven and bake for 45 minutes. After 45 minutes, remove the foil and bake for an additional 25 minutes. 8. Turn on the broiler and allow the chicken to crisp for 1-2 minutes, watching closely. 9. Carefully remove from the oven and enjoy! I love veggie burgers! While my Black Bean Burgers are my go-to, there are times when I want something a little different. By including carrots in this recipe, there is a slight sweetness to the dish. The mushrooms beef up the texture and body of the patties while increasing the potassium content. The best thing about this recipe is that not only is it delicious, but it serves 6! 1. In a large mixing bowl, use the back of a wooden spoon to completely mash all of the black beans. Add the remaining vegetables, garlic, egg, chili sauce, and salt/pepper. Use your hands to thoroughly combine. 2. Add half of the bread crumbs. Work the mixture together. Add remaining bread crumbs and combine completely. due to the size of my skillet. 3. Flatten the mixture out in the bottom of the bowl. Use your hand or spoon to divide the mixture into 6 even parts. 5. Place 3 patties at a time into the skillet. Allow to cook for 7 minutes on the first side. Carefully flip and cook for a remaining 3-4 minutes on side 2. Remove to cool slightly. Repeat the process for the remaining patties. 6. Serve atop a bed of greens, as a sandwich, or inside a wrap. No matter how you choose to enjoy them, they are divine! What is more sinful that chocolate???? When it comes in the form of a gooey brownie over rich Oreo's and topped with vanilla ice cream, I would say nothing in the food world can be more sinful. This dessert is perfect for camping trips or back yard parties. The texture of the brownie is devilishly gooey and full of fudge goodness. The Oreos soften into a delicious crust with warm cream filling. Just make sure you have people to share with when you make this dessert. The finished product is so good that you will want to keep it all for yourself, but it is so rich that you know you cannot make it through! S'mores??? Who needs them when you have Original Sin?!?! 1. Grease the inside of a 10-inch Dutch Oven with butter. Line the bottom with cookies to form an even layer. 2. Combine the oil, sugar, eggs and vanilla in a large bowl. Whisk to combine. 3. In a separate bowl, combined salt, baking powder, flour and cocoa. 4. Slowly whisk the dry ingredients into the wet. Add the melted butter. Stir until thoroughly combined. 5. Pour the batter over the cookies, making sure to cover all cookies and fill in all spaces. 6. Place the lid on the Dutch Oven. 7. Bake with 5 hot coals (grey and ashy) on the bottom and 15 on top. 8. Allow to bake until completely set on top. The inside will still be gooey. This should take 30-40 minutes but will depend on how hot the coals are when placed on the oven. 9. Carefully remove from the coals. 10. Spoon into a bowl and serve with ice cream. Note: This delicious dessert can be made in a traditional oven. Simply use a 9-inch cake pan instead of the Dutch Oven. Bake at 350-degrees for 25-35 minutes, checking often to not overcook. Weekend mornings are a time for slowing down and enjoying a special treat for breakfast. Most Saturday mornings, I make muffins or breakfast sandwiches. While both are great, this morning, I needed to use up some bananas that did not get eaten this week. Immediately, I thought of the heavenly smell of warm banana nut bread filling the house, waking my husband from his long night's sleep. I will admit that I adore traditional banana nut bread, but I always feel as though there is something missing. In this recipe, I added cinnamon and nutmeg to provide a warmth and depth of flavor that cannot be achieved any other way. For those of you who say, "I do not like bananas," you should still give this recipe a try. My husband said that it reminded him of carrot cake! 1. Whip the butter/margarine in a large mixer for 2 minutes, until light and fluffy. 2. Add the sugars and mix until creamed. 3. Add the eggs. Stir to combine. Add the egg whites one at a time, beating well between each addition. 4. Add the bananas in two batches, beating well between each addition. Allow to cream together for 2 minutes. 5. While the bananas are creaming, sift together 3 1/2 cups flour, baking soda, salt, baking powder, cinnamon and nutmeg. Sifting here is VERY important. This will allow the bread to be lighter. 6. With the mixer on low speed, add 1/3 of the flour mixture. Mix until just combined. Add 1/2 of the milk and mix to combine. Repeat with another addition of the flour and then the remaining milk. Add the last 1/3 of the flour last. Mix until just combined. 7. Place the walnuts in a small bowl and sprinkle with the remaining 1 teaspoon flour. Stir to coat. This will ensure the nuts are throughout the bread and not just on the bottom. 8. Using a mixing spatula, stir the nuts into the bread mixture. 9. Spray the bottom of 2 9x5-inch loaf pans. Evenly divide the bread between the two pans. 11. Remove from the oven and allow to cool in the pans for 10 minutes before turning out. 12. Carefully slice and enjoy! Summertime means warm days, long evenings, patio parties and fresh garden vegetables. I love fresh vegetables straight from the garden! The sweetness from locally grown produce cannot be matched. Here in the South, fresh corn on the cob is already filling the store shelves. The tender, sweet kernels filled with milky goodness scream summertime to me. I have vivid memories from my childhood of sitting on the front porch with my brother having to shuck the corn, using an old sock to rub all the silk off the cobs. I hated the job when I was a kid. It seemed to take endless hours to get the entire harvest clean. However, now that I am an adult, I cannot shuck an ear of corn without thinking about that time on the front porch. In recent years, I have found that I love to grill fresh corn. The sweetness pairs perfectly with grill. 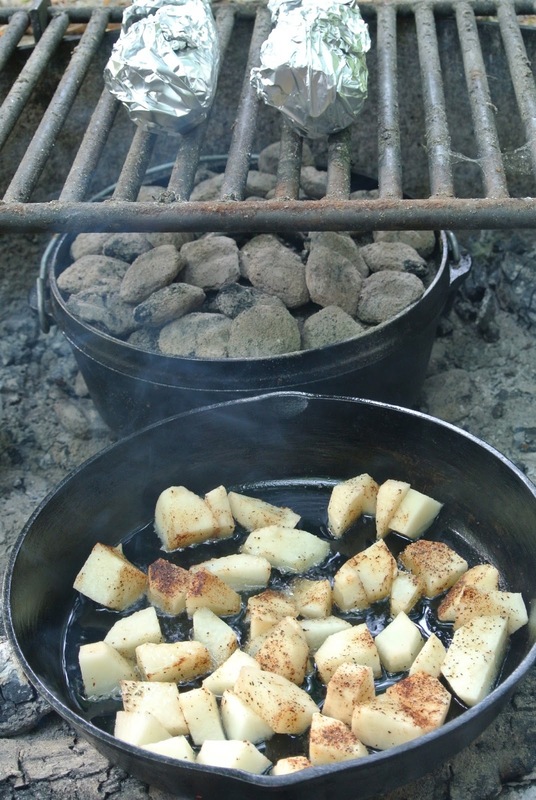 This recipe is one that we often use while camping. By wrapping the cobs in aluminum foil, instead of their own husks, you don't have to worry about the corn becoming burnt or the husks going up in flames.....does it sound like i have experienced that before?? The butter and seasoning melt into the tender kernels and leave an infused flavor that is perfect with any summertime meal. 1. Shuck and remove the silk from the corn. 2. In a small bowl, carefully combine the butter and seasonings to form a compound butter. 3. Place each ear of corn on a piece of aluminum foil. 4. Using your fingers, spread half of the butter mixture on each ear of corn, thoroughly coating. 5. Tightly wrap in the aluminum foil. 6. Grill over medium heat for 45 minutes, turning every 15 minutes. 7. Remove the foil, being very careful to avoid the hot steam. My husband and I love to grill in the warm summer months. Whether it involves breaking out the smoker and making a delicious pulled pork or lighting up the charcoal for burgers and chicken, the grill is one of our favorite cooking tools. This past weekend, we decided to grill some chicken for Sunday dinner. As most people know, grilled chicken can become boring very fast. However, we love to put a spin on the standard chicken with new spice blends and marinades. This recipe provides a slight spice to the chicken without being overtly hot. By marinading the chicken, the flavors are allowed to fully penetrate the meat. By grilling over charcoal, an extra layer of flavor is added to the meal. 1. Place all ingredients inside a large, resealable bag. Gently massage the meat to thoroughly coat the chicken and combine the ingredients. 2. Set the sealed bag in a large bowl. 3. Place in the refrigerator for 5 hours to marinate, turning over at least once during the marinating process. 4. When you are ready to grill, remove the chicken from the refrigerator and allow to sit on the counter while the grill heats. 5. Prepare your grill to medium heat. Place the chicken on the grill, skin side down. Close the grill lid. 6. Cook the chicken for 15 minutes, turning when browned on each side. You want to cook the meat slow enough to crisp the skin while cooking throughout. If your grill is too hot, the skin will burn and the inside will still be raw. If your grill is too cool, the chicken will smoke instead of cook and the time will be increased. Note: You can use this same marinade recipe with other cuts of chicken as well as pork chops. This past weekend, my husband and I took a well-deserved camping trip to a remote part of North Carolina. Nestled deep within the woods of the Appalachian Mountains, there was no thought of fancy dinners at a fine dining restaurant or even hitting the night scene at the hip new stop. Instead, we were back to a slower time. Back to times where we could relax under the trees beside a rippling river stream, spend the days beside a pond waiting for the fish to bite, and finish the day next to a roaring campfire with a wonderful campfire dinner. The first night of our adventure, I decided to try a new recipe for beans. The prior week I had tried some Taco Seasoned Baked Beans at a lunch at work. Immediately, I asked for the recipe. I adapted the recipe for campfire cooking and Mexican Campfire Beans were born. There are several things about this recipe that are great. One, they taste AMAZING! Although there are nodes of the traditional baked beans, the seasoning is just different enough to leave everyone wondering what that special smokey flavor comes from in the dish. Two, they are a one pot wonder. You can easily adapt the recipe for the oven. Simply bake in a dutch oven at 350-degrees instead of over the campfire. Three, leftovers are great! You can use the leftovers for a hearty lunch, toppings for nachos, or, as we did, spice them up with onions, cayenne, red chili flakes, and seared hot dog rings and create a spicy pork and beans. I think my favorite part about this recipe are the memories from the night. So often in our hectic lives, we lose sight of slowing down and spending time together. I truly believe that getting back to a simpler time is good for everyone. Without cell phones, computers, and television to distract us, we are able to appreciate the wonderful things in our lives and, dear I say, have true conversations with each other. So every time I make this recipe, I will remember the first time and the wonderful weekend with my husband. 1. In a large Dutch Oven (at least #10 size) sauté the hamburger meat and taco seasoning over high heat, stirring to break apart. 2. Once the meat is browned, carefully add the remaining ingredients to the pot. Stir well to combine. 3. Place the lid on top. Carefully place hot coals on top of the lid. For our pot, which is a #10 Dutch Oven, we used 5 coals on the bottom and 15 on top but you will need to refer to your reference guide for the proper number of coals based on your Dutch Oven size. You want the beans to bake at 350-degrees. 4. Allow the beans to bake for 45 minutes. 5. Carefully remove the lid and stir. Allow to simmer, uncovered, for 15 minutes.